People gathered at Parliament in Wellington on Thursday, 8 March to protest the signing of the Comprehensive and Progressive Trans Pacific Partnership Agreement. I spoke on behalf of the New Zealand Nurses Organisation. Thenks to Amanda Vickers for the recording. NZNO Co-leaders Grant Brookes and Kerri Nuku speak up on the Trans Pacific Partnership, today at Parliament and on the National Day of Action in March, 2015. “E ngā iwi, e ngā mana, e ngā hau e wha, tēnā koutou. Greetings to the people, the great ones and to those from from afar. My name is Grant Brookes. I am a Registered Nurse, and the president and co-leader of the New Zealand Nurses Organisation Tōpūtanga Tapuhi Kaitiaki o Aotearoa. And this? This is the first day of a future where trade agreements serve the needs of citizens and our natural environment. Despite the weather, it is wonderful to be here to share this day with you. 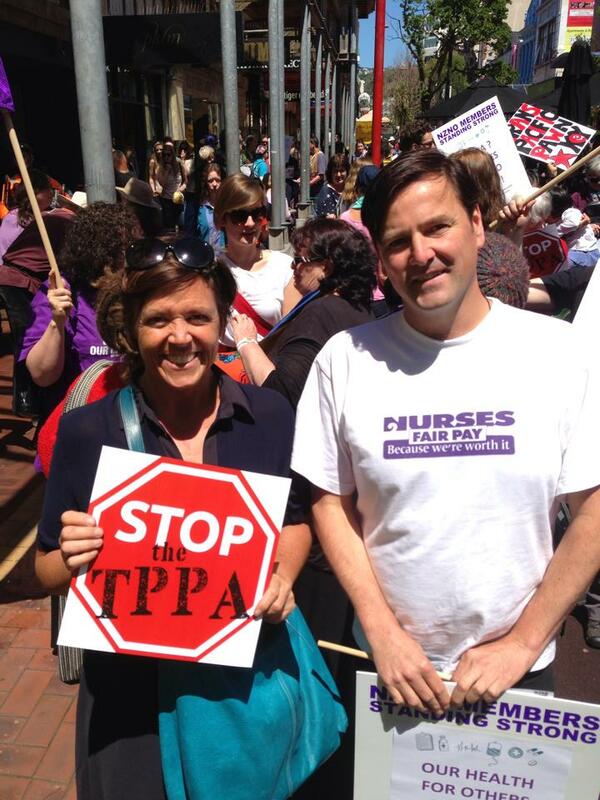 The New Zealand Nurses Organisation objects to the New Zealand government’s intention to sign the Comprehensive and Progressive Trans Pacific Partnership Agreement in Chile later today. We assert that although some improvements have been made, the CPTPP is not ready to be signed. Trade Minister David Parker acknowledges that the deal is not perfect. He told Newshub last week that he gives it a score of “seven out of ten for New Zealand”. Let’s just imagine, for a minute, that that score is accurate. What does seven out of ten mean, when it comes to your health? What if you went to the Emergency Department with a serious cut, and you were told that you could have stitches to seven tenths of your wound? What if you were in severe pain, and you were given treatment that left you 30 percent sore? Nurses work for the best possible health status for all peoples in Aotearoa New Zealand. We cannot support the CPTPP because despite improvements on the original TPPA, threats remain to population health and all that sustains it. Intellectual property provisions which would delay access to affordable new medicines have been “suspended” for now, but they are still in the text and could be reactivated. The same is true, despite side agreements, for the Investor State Dispute Settlement provisions which privilege multinational corporate interests above our sovereign and indigenous interests. The Treaty of Waitangi exception in the agreement is not robust enough to ensure indigenous rights are protected and it’s not consistent with the recommendations of the Waitangi Tribunal. This means Māori-led efforts to address health disparities could be undermined. The Labour Chapter will not protect the decent jobs, liveable incomes and fair treatment at work needed to sustain healthy communities. And the Environment Chapter does not even mention climate change, which the World Health Organisation calls “the greatest threat to global health in the 21st century”. Defenders of the deal point elsewhere, to possible economic gains (though no-one today is claiming they’ll be huge). But is that the right way to look at it? What are a few extra dollars really worth, if you don’t have your health? Around the world, the thinking on trade and investment agreements is shifting, away from a sole focus on narrowly-conceived economic gains. The New Zealand Nurses Organisation has promoted this shift, from first hearing of the TPPA the better part of a decade ago, through the High Court challenge to the government’s secrecy which our other co-leader Kerri Nuku joined in 2015, to the massive protests in 2016, and up until today. We will continue to work for this healthy future. In reality there’s no way of knowing how the CPTPP rates on a health scorecard – whether it’s seven out of ten, or one out of ten. This is because there has been no health impact assessment of the deal. Until there is an independent health impact assessment, which the Labour Party campaigned for while in opposition, then as nurses we say please, ‘Don’t sign!’. Kia ora koutou. My name is Grant Brookes. I’ve been asked to speak here today, when rallies are taking place against the Trans-Pacific Partnership Agreement all around the country, as a nurse and the President of the New Zealand Nurses Organisation. NZNO is an organisation of 47,000 members. We’re the union for nurses, midwives, and other members of the care team, and the professional association for nurses in New Zealand. This week, we had our annual conference. We talked about many things. One of them was anti-microbial resistance. It’s something you might have heard about, in the news? The worrying emergence of new “super-bugs”, which are immune to all known antibiotics. Some of us might have started to wonder whether the Trans-Pacific Partnership Agreement was like a super-bug. It was starting to seem that no matter what was thrown at it, this infection in our body politic could not be cured. Opinion polls showed most people opposed it, thousands of parliamentary submissions opposed it, tens of thousands of people protested against it, and still the TPPA infection was spreading. But I am pleased to tell you that the TPPA is not a super-bug. We’ve found an effective treatment, and this particular infection looks likely to be cured. And I’m proud to say that nurses have been administering the medication. All signs at the moment indicate that the United States will not ratify the deal, at least in its present form. Barack Obama is facing what looks like insurmountable opposition in Congress, and will leave office in January. If the US doesn’t ratify, then whole deal collapses. The idea is being peddled that Donald Trump, the master flip-flopper, is responsible for building this opposition to the TPP. Don’t buy it. The reason that US politicians have gone cold on the deal was the groundswell of opposition in the Democratic Party this year, especially around the presidential challenger Bernie Sanders. And NZNO’s sister union over there, National Nurses United, was at the heart of that groundswell. They lobbied, they protested, they built Bernie’s campaign, and they highlighted the health impacts to the American public. The TPPA would have made medicine even less affordable, stymied regulation of the unhealthy things being pumped into our food and our environments – including greenhouse gases – and increased the social inequality and stress responsible for much ill-health. And there’s even a link between the TPPA and the emergence of the real super-bugs. Because in the United States, 80 percent of all antibiotics are given to livestock. American farm animals consume antibiotics for breakfast, lunch and dinner, added into their feed. It’s this kind of indiscriminate use in farming, thanks to weak regulation, which is the main reason behind the growth of anti-microbial resistance now threatening human health. And the TPPA is all about exporting America’s model of regulation to other countries, furthering the spread of the problem. So now that we’ve found an effective treatment to cure the TPPA infection, what we need to do is step up the dose – because even though we’re well on the way to recovery from the TPPA, our government is pressing ahead with law changes in line with the TPPA anyway. And we’re already being threatened by the next infections – the Regional Comprehensive Economic Partnership (RCEP), the Trade in Services Agreement (TISA) and a possible renegotiated TPPA Mark Two. • Trade and investment agreements should prioritise health and social and ecological sustainability as well as economic development. • Trade and investment agreements, and their dispute settlement mechanisms, should be consistent with international law with regard to health, human rights, the environment, and worker protection. a. prioritise equity within and between countries for global population health improvement. b. not limit or override a country’s ability to foster and maintain systems and infrastructure that contribute to the health and well-being of its citizens, nor penalise a government for doing so. c. preserve policy space for governments to regulate to protect public health. e. be subject to health and environmental impact assessments that are carried out by parties independent of corporate interests. Thank you for the opportunity to present an oral submission on behalf of the New Zealand Nurses Organisation. NZNO is the leading professional nursing association and union for nurses in Aotearoa New Zealand. We represents over 47,000 nurses, midwives and health workers on professional and employment related matters. NZNO is affiliated to the International Council of Nurses and the New Zealand Council of Trade Unions. NZNO embraces te Tiriti o Waitangi and contributes to the improvement of the health status and outcomes of all peoples of Aotearoa New Zealand. My name is Grant Brookes. I am a Registered Nurse of 20 years experience, and the President of NZNO. Joining us on the phone shortly will be Kerri Nuku, our Kaiwhakahaere and co-leader. Also with me today are Cee Payne, NZNO Industrial Services Manager, and Marilyn Head, Senior Policy Analyst, who are available to answer questions. Kerri will explain how the Trans-Pacific Partnership Agreement relates to the key global health challenges of the 21st century, in particular with regard to Chapter 28 (Dispute Settlement) and Chapter 29 (Exceptions and General Provisions). But first I wish to reinforce some key points from our written submission, from a nursing perspective, including some comments on Chapter 18 (Intellectual Property). NZNO has been very clear throughout that we have no position, for or against, international trade or free trade agreements (FTAs). Our concern is health. In New Zealand, as all nurses understand, healthcare is built on an ethical foundation of informed consent. This supports our commitment to patient-centred care. • the probable beneﬁts, risks, and side-effects – as well as the risks and benefits of not receiving the treatment or procedure. From a nursing perspective, the TPPA is being imposed upon citizens without seeking their consent, or the consent of their elected representatives. We reject the avowals of Minister of Trade that it was the most extensively consulted agreement. Consultations which did occur were with selected participants, and mostly took the form of diplomatic updates. Equally, we have not been informed about the health benefits and risks. A recent review article in the International Journal of Health Policy Management shows that there are a number of potential health risks associated with the TPPA, and details a range of policy implications for health – in particular, intellectual property rights, the ISDS, technical barriers to trade, sanitary and phytosanitary measures and regulatory coherence provisions. This is why New Zealand needs to conduct a health impact assessment. From a nursing perspective, the TPPA is not patient- or person-centred. It is, as the NZCTU say in their submission, “structurally biased towards commercial interests”, which are normalised and privileged above other functions of government such as the protection of human rights and the environment, and the promotion of health. We may have been denied the opportunity to speak with the Health Select Committee. But we do not accept that trade and investment agreements can, or should, be negotiated without oversight from the health sector. And we do not accept that these agreements should privilege commercial interests ahead of the interests of patients. As it stands with the TPPA, there are a range of provisions in the IP chapter, the net effect of which, as they apply to medicines, is to delay market entry of the cheaper generic drugs which PHARMAC relies on to provide affordable medicines from its limited and capped budget. Any barrier to the production of, or delay in access to, generics inevitably means higher costs and that, in turn, restricts the medicines which PHARMAC can afford to fund. The ones who will be most affected are the most vulnerable. The TPPA also introduces new provisions for a broad new class of drugs, biologics, which derive from protein-based living cells manufactured in a laboratory, rather than traditional chemical compounds manufactured in a laboratory. They include vaccines, blood products, insulin, and monoclonal antibodies such as Herceptin and Keytruda, and have opened up a new world of effective treatments for many diseases and autoimmune conditions such as cancer and arthritis. Biologics, including their generic counterpart, “biosimilars” are the fastest growing and most expensive group of medicines and they represent an increasing proportion of PHARMAC’s budget. Article 18.52 provides for market exclusivity for biologic medicines by either eight years data protection OR five years plus additional measures to provide “effective market protection” and deliver “a comparable outcome in the market”. Currently MedSafe approval is taking an average of 18 months after the exclusive five year period. Is this “a comparable outcome in the market”? Already the US pharmaceutical lobbyists are arguing that it is not. The three year difference is critical since any delay in introducing competition will affect which medicines can be included in the budget. It will literally be a matter of life and death to some New Zealanders if market exclusivity is pushed out towards eight years. • initiate an open inquiry into the process by which international treaties are ratified, with a view to implementing parliamentary, rather than Cabinet, ratification. Notes of a talk given at public meetings in Newtown, Lower Hutt, Otaki and Wainuiomata organised by TPP Free Wellington and the Horowhenua TPPA Action Group, January 2016. Kia ora koutou. Good evening. My name is Grant Brookes. 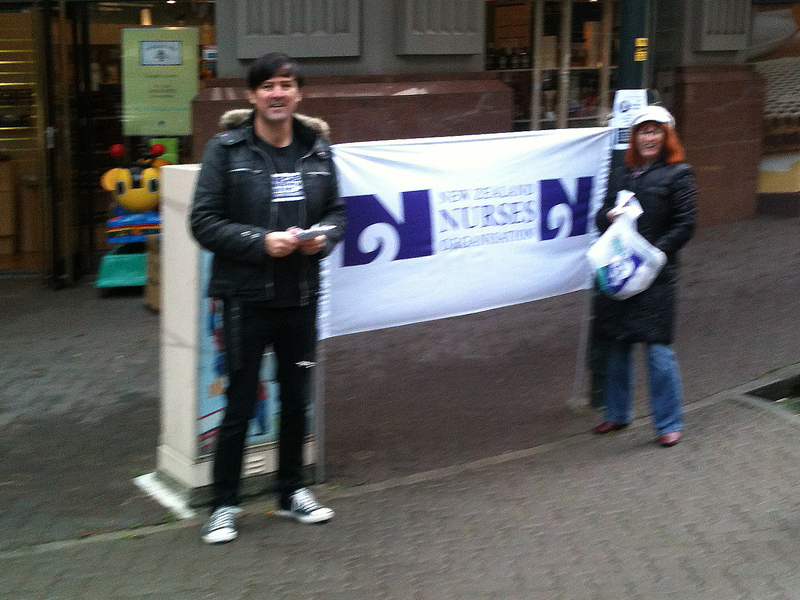 I am a Registered Nurse, and the President of the New Zealand Nurses Organisation. NZNO is the leading professional association and union for nurses in Aotearoa New Zealand, representing 47,000 nurses, midwives, students, kaimahi hauora and other health workers. NZNO embraces Te Tiriti o Waitangi and works to improve the health status of all peoples of Aotearoa New Zealand through participation in health and social policy development. I was invited along tonight to give an expert opinion on the health impact of the TPPA. But I need to stress that my areas of expertise – in nursing, and health policy – are not sufficient, in themselves, to provide this. Having read the 599 pages which comprise the core of the agreement (excluding side instruments and some of the annexes), it is abundantly clear that legal expertise in the interpretation of international treaties is also required. A full, peer-reviewed analysis of the health impact of the TPPA by suitably qualified experts is yet to be published for the New Zealand setting. But with these large caveats in mind, I will offer a few thoughts on the topic. Let’s recap. Over the course of seven years of negotiations, attention on the health impacts of the Trans-Pacific Partnership Agreement in New Zealand focused heavily on a few aspects of healthcare provision – specifically the cost of medicines – and on a handful of regulatory issues in public health – especially tobacco control. The potential health impacts of the TPPA are not limited to these matters. But I will talk about them, before touching briefly on some of the more far-reaching implications for health in the agreement. The complexity of the document is such that understanding the issues requires in-depth examination. So I hope you will bear with me as I go into some detail. When negotiations concluded in Atlanta last October, government politicians rushed to declare that the health concerns which critics had been raising were fully addressed in the final agreement. By and large, media reports reflected this government line. Alongside commercial affirmations about the “the need to recognize the value of pharmaceutical products and medical devices through the operation of competitive markets”, the text acknowledges “the importance of protecting and promoting public health and the important role played by pharmaceutical products and medical devices in delivering high-quality health care” and “the need to promote timely and affordable access to pharmaceutical products and medical devices”. Significantly, the Annex says that, “The dispute settlement procedures provided for in Chapter 28 (Dispute Settlement) shall not apply” to PHARMAC, “with respect to PHARMAC’s role in the listing of a new pharmaceutical for reimbursement on the Pharmaceutical Schedule”. Then there is “CHAPTER 29: EXCEPTIONS AND GENERAL PROVISIONS”. “Article 29.5: Tobacco Control Measures” says that, “A Party may elect to deny the benefits of Section B of Chapter 9 (Investment) with respect to claims challenging a tobacco control”. In other words, tobacco companies can be barred from suing governments over their smokefree policies, via the notorious Investor-State Dispute Settlement (ISDS) process. The inclusion of ANNEX 26-A and Article 29.5 is testament to the efforts of those of us who have campaigned for years against the TPPA in the name of public health. But is it true, as media and politicians would have us believe, that these clauses are enough to safeguard health and mitigate the impacts of the TPPA on healthcare provision, and on public health regulation? To answer that question, we have to understand how PHARMAC works. The Pharmaceutical Management Agency (commonly known as PHARMAC) successfully manages the cost of medicines in New Zealand, through a range of mechanisms. For example, under the PHARMAC model, generally only one brand of each medicine is subsidised at any given time. If a prescriber writes a community pharmacy script specifically naming a different brand (which they can still do), the patient will pay the full price at the chemist, rather than the usual $5 per item. As a result, very few unsubsidised brands are prescribed. This means that PHARMAC can force pharmaceutical companies to compete, driving down prices. New Zealand’s pharmaceutical budget of $800 million (or around $200 per person, per year) is low by international standards. The media reports were accurate when they said that this model will remain under the TPPA, and that one-off compliance costs of $4.5 million and increased operating costs of around $2.5 million a year represent a tiny proportion of PHARMAC’s budget. However, tendering out the right to be the sole subsidised brand in this way is not possible if a single pharmaceutical company holds the patent for a particular drug. In that case, the company can effectively set the price at which New Zealanders can access that medication. Therefore, longer patents mean higher medicine costs – and potentially, much higher costs. Currently in New Zealand, patents on most medicines expire after 20 years, while for a new class of medicines, known as biologics (sometimes called “specialty drugs”), patent protection lasts for five years. For example, a drug company will be able to patent “new uses of a known product, new methods of using a known product, or new processes of using a known product” (Article 18.37.1). This is what’s known as “evergreening” patents. Consider what this means. For many decades, aspirin was used to relieve pain and fever. Then, in the early 1970s, studies found that aspirin was also effective in reducing the incidence of heart attacks and strokes. Under the provisions of the TPPA Intellectual Property Chapter, the drug company Bayer (the original patent-holder) could potentially have applied for a new patent for this new use for aspirin, and ratcheted up the price. This is not an isolated example. The history of medical practice is full of drugs which were developed to treat one condition, and later put to new uses. In my field of psychiatry, for instance, first-line therapy for the treatment of bipolar mania is a drug called valproate – which was initially used to treat epilepsy. Prochlorperazine – initially used in the treatment of schizophrenia – is now more commonly prescribed in low doses for nausea (including morning sickness during pregnancy). Prazosin, an anti-hypertensive drug used to treat high blood pressure, has recently been found to be effective in reducing the severity of nightmares associated with Post-Traumatic Stress Disorder, and so on. Under the TPPA, all of these developments could potentially have resulted in higher medicine costs. The greatest impact on PHARMAC, however, will probably come from extended market exclusivity for new kinds of medicine called “biologics”. This new class of drugs are derived from biological processes, instead of being created in the lab through chemical interactions. Biologics include so-called “specialty drugs”, some of which are enormously expensive. Perhaps the best known example is pembrolizumab, marketed under the brand-name Keytruda, which was the subject of a petition and extensive media coverage last year. This melanoma drug saves lives, but patent-holder Merck charges $300,000 per patient. In Australia, meanwhile, monopolies on just ten biologic drugs listed on the Pharmaceutical Benefits Scheme cost taxpayers over $205 million in 2013-14. As mentioned previously, New Zealand laws currently give a five year monopoly to drug companies holding patents in biologics, during which they can name their price. According to former trade minister Tim Groser, patent terms for biologics will not change under the TPPA. His view is not shared by US Deputy Trade Representative Robert Holleyman, who told the US Chamber of Commerce 2015 Global IP Summit last year that: “TPP will require, for the first time in a trade agreement, Parties to provide an extended term of effective market protection for biologic medicines”. There has been speculation that pharmaceutical companies may pressure US representatives to renegotiate parts of the Intellectual Property Chapter, or seek other assurances, to “clarify” that. But to my eyes, it seems pretty clear that Article 18.52 of the TPPA, as it stands now, means that Robert Holleyman is right and that “effective market protection” for biologics will be extended to eight years. Each additional year added to the monopoly period today would “add tens of millions of dollars” to New Zealand’s drug bill. But if prescribing trends here follow those predicted in the United States, then the TPPA’s extended market protections (patents, in other words) for biologics could be costing taxpayers (or patients, or both) hundreds of millions of dollars a year, within a decade. But while the cost of medicines has received the greatest attention, it is far from the only aspect of healthcare provision which could be affected by the TPPA. If these changes went ahead, then large parts of our health system could become subject to TPPA “CHAPTER 10: CROSS-BORDER TRADE IN SERVICES”. This chapter applies wherever a service is supplied on a commercial basis or in competition with one or more service suppliers. Article 10.3 (National Treatment) says: “Each Party shall accord to services and service suppliers of another Party treatment no less favourable than that it accords, in like circumstances, to its own services and service suppliers”. The assurances from politicians and media commenatators that tobacco control will be unaffected under the TPPA, sadly, are also less reliable than they appear. Analysis of the text by Louise Delany and George Thomson, of the Department of Public Health at the University of Otago, has revealed what the so-called “tobacco carve out” really means for public health. They identify a number of issues. Firstly, “Article 29.5: Tobacco Control Measures” is not compulsory, and the New Zealand government has not yet announced whether it is opting in to this exemption from ISDS provisions for policies to reduce smoking. Secondly, while this Article means that tobacco companies can be barred from suing governments under ISDS provisions, the rest of the TPPA still applies. And the TPPA provides mechanisms to pursue complaints for breaches of its obligations, apart from the ISDS process. So for example, another government could still initiate complaints (perhaps acting on behalf of domestic tobacco interests) that New Zealand’s smokefree laws breach the TPPA. In addition, “CHAPTER 25: REGULATORY COHERENCE” says that, “in the process of planning, designing, issuing, implementing and reviewing regulatory measures in order to facilitate achievement of domestic policy objectives… The Parties affirm the importance of… taking into account input from interested persons in the development of regulatory measures” (Article 25.2). And to be clear, “person means a natural person or an enterprise” (Article 1.3). In other words, under the TPPA our government must allow interested enterprises – cigarette companies – to have input into the planning, designing, issuing, implementing and reviewing of our smokefree policies. “We may think that barring big tobacco from using the ISDS clauses has put the issue to bed”, comments Public Health Association Chief Executive Warren Lindberg. “It hasn’t”. He goes on to mention that “there remain plenty of other multinationals prepared to further their own interests at the expense of smaller economies like ours – such as big pharma, big food and big energy.” And there are no exemptions at all to protect Public Health from these others. The chapter says that governments must not “expropriate or nationalise a covered investment either directly or indirectly… except… on payment of prompt, adequate and effective compensation” ( Article 9.7). The banning of “indirect expropriation” can potentially mean that governments can be sued for any “action or series of actions” which has an “economic impact” affecting an investors “expectation of gain or profit” (Annex 9-B Expropriation). There might appear to be a Get Out of Jail Free clause, for “regulatory actions by a Party that are designed and applied to protect legitimate public welfare objectives, such as public health”. But the footnote makes it clear that, “For greater certainty and without limiting the scope of this subparagraph, regulatory actions to protect public health include, among others, such measures with respect to the regulation, pricing and supply of, and reimbursement for, pharmaceuticals (including biological products), diagnostics, vaccines, medical devices, gene therapies and technologies, health-related aids and appliances and blood and blood-related products.” In other words, they do not include the vast bulk of what we consider Public Health regulations. So it is easy to see Coca-Cola suing any government trying to bring in a sugar tax to tackle obesity, for example, on the basis that lost sales were an indirect expropriation of their investment. Tighter regulation of casino operators to reduce the harm from problem gambling, although hard to imagine under the current government, could be the subject of a future claim for compensation from offshore investors. Japan’s Kirin Holdings, which owns breweries responsible half of New Zealand’s beer output, would be in prime position to sue if government regulated to reduce alcohol consumption and harm. Even policies such as the removal of GST on fruit and vegetables, designed to promote consumption of fresh, healthy foods in place of processed foods, could see our government targeted by multinational food and beverage manufacturers. I’d like to conclude by looking briefly at some of the health issues which have not been a major focus of attention so far, but which are possibly the most far-reaching of all. They are the impacts of the TPPA on the social determinants of health. The Commission has drawn attention to the role of agreements like the TPPA in creating this toxic combination. “A key recommendation from the Commission is that caution be applied by participating countries in the consideration of new global, regional, and bilateral economic (trade and investment) policy commitments”. On the face of it, there are chapters in the TPPA apparently protecting these social determinants of health. To address the quality of the natural environment in which people reside, the TPPA has “CHAPTER 20: ENVIRONMENT”. For employment and working conditions, there is “CHAPTER 19: LABOUR”. The unequal distribution of power, income, good and services – within and between countries – could be seen as covered by “CHAPTER 21: COOPERATION AND CAPACITY BUILDING” and “CHAPTER 23: DEVELOPMENT”. But what do these chapters actually say? World Health Organisation has called climate change “the greatest threat to human health this century”. The TPPA Environment Chapter says nothing about climate change. On the contrary, ISDS processes like the ones in the TPPA are being used right now to challenge government action protecting the climate. Last November, US President Obama announced that the Keystone XL pipeline, designed to facilitate the extraction of oil from vast tar sands in Northern Canada, would not go ahead. Climate campaigners around the world breathed a sigh of relief. NASA climate scientist James Hansen had earlier said that if Keystone XL went ahead and all the Canadian oil reserves were extracted and burnt, then it would be “essentially game over” for Earth’s climate. Yet investors in the TransCanada pipeline company are suing the US government for $15 billion compensation, alleging that their investment has been expropriated as they were denied the right to cook the planet to death. The so-called Environment Chapter is actually about the removal of environmental regulation and empowering investors to sue governments for tackling climate change. That sounds fine, except that the ILO Committee on Freedom of Association has repeatedly found that labour laws in the United States fail to uphold rights enshrined in ILO conventions, including those in a recent case brought by twelve Charge Nurses at the Oakwood Heritage Hospital in Michigan. Nurses in Los Angeles protest US labor laws denying freedom of association, 2006. ILO rights, such as freedom of association and the right to collective bargaining, have not been adequately reflected in US law since 1947. If the US has denied basic labour rights for 70 years, does anyone think they will start honouring them because they’ve signed the TPPA? In New Zealand, the Employment Contracts Act introduced by the previous National Government in the 1990s was also found to be in breach of ILO conventions. The government essentially ignored the ruling. It is arguable that today’s Employment Relations Act, as repeatedly amended under the current government, also breaches the labour rights proclaimed in Chapter 20 of the TPPA. On closer inspection, the three Chapters which might be seen as addressing the social determinants of health have two things in common. Firstly, they all contain a clause stating: “No Party shall have recourse to dispute settlement under Chapter 28 (Dispute Settlement) for any matter arising under this Chapter.” In other words, they’re toothless. Secondly, they’re short – taking up just 21 pages, in total, in the 599-page agreement. In other words, they’re little more than window-dressing. But they do contain a revealing statement of the ideology on which the TPPA is based. “Economic growth reduces poverty” – this is the same tired, old story we’ve been told for the last 30 years. Repackaged time after time, who remembers these versions? “A rising tide lifts all boats”, “the best way to get a bigger slice for the poor is grow the pie”, “support the wealth-creators and the wealth will trickle down”. Meanwhile, as deregulation and trade liberalisation rolled onwards over these 30 years, the unequal distribution of power and income grew worse. Social determinants of health – in schooling, working conditions, and the quality of housing and the natural environment – deteriorated. Health inequalities have grown dramatically. Non-communicable diseases and diseases of poverty have mushroomed. As mentioned at the outset, I am not qualified to give a comprehensive expert opinion. But I can confidently say this: the health impacts of the TPPA will be more of the same. Eyes around the world have been focused on Washington this week, as President Obama wrestled with US law-makers to get authority to sign the Trans-Pacific Partnership Agreement (TPPA). So far, Congress has withheld the full “fast track” authority needed by the President. Without it, the controversial 12-nation trade and investment treaty could be sunk. 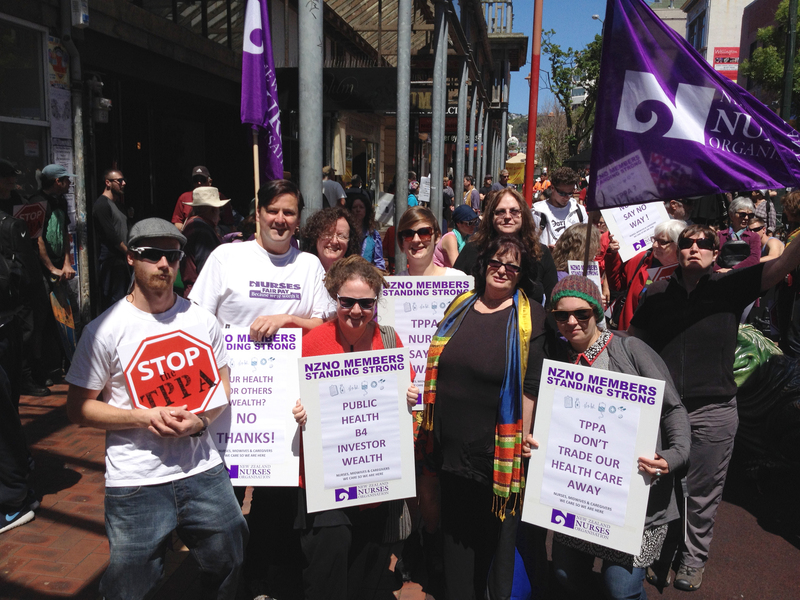 There’s a lot at stake for nurses in the battle over the TPPA. Will we start to have more say in the health system? Or will we be further marginalised and ignored, as health decision-makers bow to threats of legal action in shadowy offshore tribunals, made by big corporations? This prospect is why nurses in America have been lobbying hard to stop Congress from granting fast track authority to President Obama. And it’s why NZNO is part of the campaign to stop the TPPA here. We know that the TPPA would mean the dismantling of PHARMAC, leading to higher medicine costs. And it would mean legal challenges to public health measures such as those targeting smoking and obesity. And we know that Prime Minister John Key’s comment this week that medicine costs won’t go up under the TPPA is not credible. But our governing body, the NZNO Board of Directors, is not unanimous. Last year, it considered (and thankfully discounted) a proposal that NZNO should drop its opposition to the TPPA. 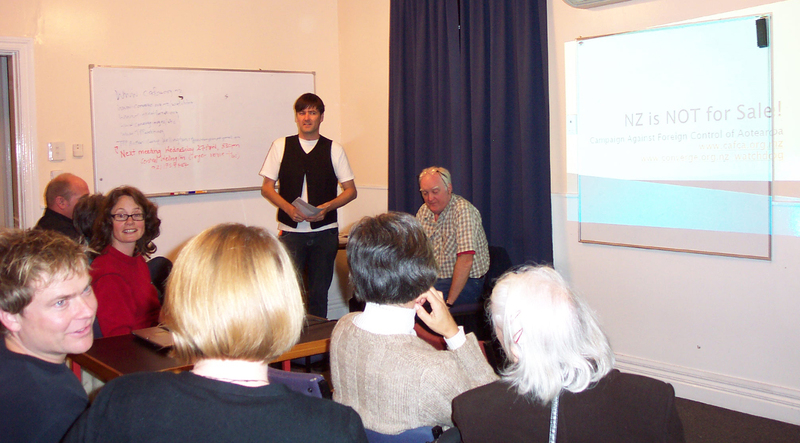 As one of the early campaigners warning of the dangers of the TPPA to New Zealand, helping to organise a speaking tour on the agreement back in 2011, I worked to get NZNO on board. And I’ve been a keen participant in NZNO activities against the TPPA ever since. It is my belief that NZNO needs leaders who aren’t afraid to speak up if the Prime Minister makes inaccurate comments about health. And we need leaders who will strengthen our stand for nurse power against the TPPA.